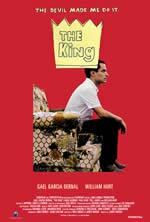 Elvis Valderez (Gael Garcia Bernal) is a twenty-one year old dreamer who has just been honorably discharged from the US Navy. With his duffle bag and rifle, he travels back to his hometown of Corpus Christi Texas, where he intends to seek out his father – a man he has only heard about from his Mexican mother, who has since passed away. Elvis quickly discovers that his father, David Sandow (William Hurt), is now the pastor of a thriving Baptist church, and has a family of his own – a beautiful wife, Twyla (Laura Harring), and two picture-perfect children, Malerie (Pell James) and Paul (Paul Dano). While seeking out his father at church, Elvis unwittingly strikes up a conversation with sixteen-year old Malerie and there’s an immediate, unspoken attraction between them. Elvis then waits for his father after church and follows him and his family to their suburban neighborhood, where he approaches David in front of their Norman Rockwell style home. The encounter is brief. David wants nothing to do with Elvis, who is an uncomfortable reminder of his own wayward past and a well-kept secret from his children and his parishioners. Rejected, Elvis resolves to leave this happy family to themselves. However, Elvis can’t shake the image of Malerie, his half sister, and can’t stop himself from befriending her. The relationship soon develops into something romantic and natural taboos are quickly discarded. Through his courtship of Malerie, Elvis begins to slowly infiltrate the family, thus setting the stage for the unleashing of violence and a tragedy of biblical proportions.